Benches cleared in Pittsburgh, days after Chicago's Anthony Rizzo illegally slid into Pirates catcher Elias Diaz on Monday, resulting in Manager Clint Hurdle ejection for arguing umpire Bill Welke's interference no-call and New York's erroneous ruling that the slide was bona fide, as the Pirates exacted a measure of revenge Wednesday evening, when a Bucks baserunner slid hard into second base during an unsuccessful Cubs double play attempt. Related Post: MLB Ejection 051 - Mark Carlson (1; Clint Hurdle) (5/28/18). Welke rules no interference on hard slide. The Play: With none out and one on (R1) in the bottom of the 3rd inning of Wednesday's Cubs-Pirates game, Pirates batter Josh Harrison hit a ground ball to Cubs third baseman Kris Bryant, who threw to second baseman Javier Baez as Pirates baserunner R1 Joe Musgrove slid into second base, resulting in a collision between the two players. As he did Monday, 2B Umpire Bill Welke ruled on the force play and declined to call interference, thus allowing batter-runner Harrison to remain at first base...and resulting in a bench-clearing incident. Accordingly, Musgrove's slide was not bona fide because he failed to remain on the base after completion of his slide. HOWEVER: If Wednesday's slide was not bona fide, then why was no double play declared? Answer: Replays indicate that after tagging second base, 2B Baez did not attempt to throw onto first to play on batter-runner Harrison. Because he did not attempt to complete a play on the following runner, Rule 6.01(j) regarding bona fide slides does not apply, meaning there was no call to review or overturn. If 6.01(j) does not apply, the play is not reviewable for that reason alone. Pursuant to a 2016 rule interpretation put out by MLB, the standard when considering Rule 6.01(j) is whether the fielder is "hindered and impeded [in his] ability to complete a double play." If there is no attempt to complete a double play, then there can be no hindrance or interference, which makes no-call the correct call. 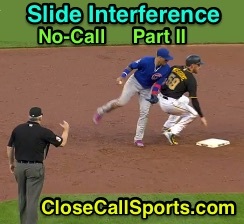 See the following link for a related slide rule interference no-call that was not reviewable because the fielder did not throw to first. Related Post: MLB Ejection 010 - Alan Porter (3; Brian Butterfield) (4/21/17). Related Post: MLB Adds Impediment to Bona Fide Slide Rule Interp (5/18/16).